This seems like a ridiculously extravagant idea and it certainly is if you don’t not have a whole lot of strawberries around. If you are buying them a basket at a time you are likely eating them right out of the basket, maybe even before they get out of your car. 😉 It’s only once we had a large crop out of our own garden that we even started thinking about drying them but once we tried them, we were hooked. Dehydrated strawberries are an exceptional snack, especially for travel, and they are simply a convenient way to preserve the strawberry flavor. 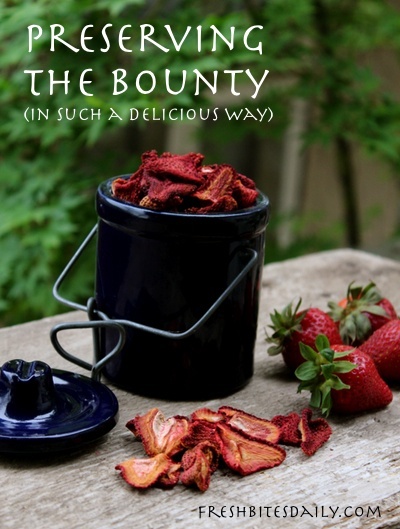 Like any other dried fruit, the flavor in the strawberry and its sugars concentrate nicely in the dried berry. Strawberries tend to be a bit dirty by nature. Their “hairy” skins are dirt magnets. Wash them well before dehydrating them but allow some time for the berries to dry after washing or they will take an awfully long time to dehydrate. You could also roll the wet berries around on a kitchen towel to help them dry but that does add quite a bit of hands-on time to the project. You can dehydrate whole berries, especially the smaller heirloom-type strawberries. The larger berries will have to be cut. I recommend cutting them only once lengthwise (after removing the green stem cap). Place them to dehydrate cut-side up. If you place them cut-side down, you will lose some of the juices to your dehydrator sheet. You want the juices to stay in that small piece of fruit and concentrate as the berry dries. Wash your berries well and allow them to dry. Use a pairing knife to remove the stem from the berries. For larger berries, cut lengthwise right through the stem end and place cut side up on the dehydrator sheet. Arrange berries on your dehydrator sheets and place in the dehydrator. Drying time will depend on your conditions but plan for about 24 hours. Check for donness. The berry will still be a bit chewy/soft when it is done, not unlike the texture of a dried persimmon or perhaps a raisin. 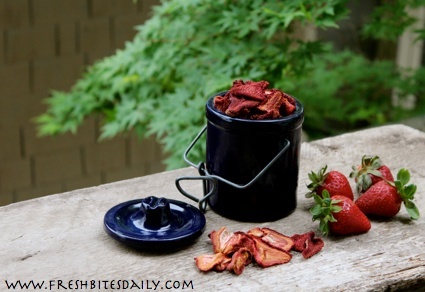 Dehydrate your strawberries using this easy drying method. Clean and drain your strawberries. For smaller berries, place de-stemmed berry directly on your dehydrator sheet. For larger berries, cut the straw berries lengthwise right through the stem end and place the cut side up on the dehydrator sheet. Arrange your berries on the dehydrator sheet and place in your dehydrator. Plan for at least 24 hours of dry time, though the drying time will vary based on your humidity. Test the berries after about 24 hours. They will be a bit leathery when done. Q: How do I store my strawberries? A: Store your dried strawberries in an airtight jar in a cool, dark pantry. Q: How long will the dried strawberries last? A: Stored in a pantry in an airtight jar, the strawberries will last for at least two years but you will likely eat them far sooner. 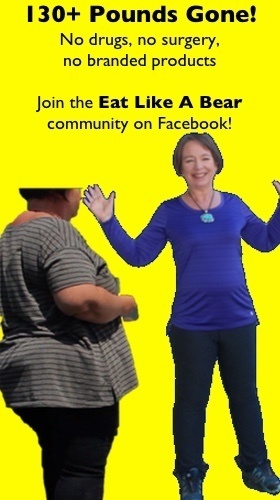 A: This is a brand we have loved for years, available at our Amazon partner here. Q: Are dried strawberries supposed to be chewy? A: Yes. Since they are typically dried whole or in halves, they tend to stay on the chewy side.